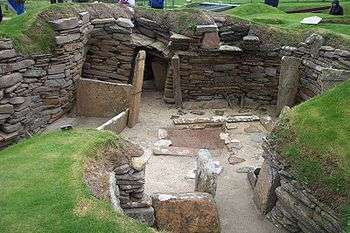 Neolithic architecture refers to structures encompassing housing and shelter from approximately 10,000 to 2,000 BC, the Neolithic period. In southwest Asia, Neolithic cultures appear soon after 10,000 BC, initially in the Levant (Pre-Pottery Neolithic A and Pre-Pottery Neolithic B) and from there into the east and west. Early Neolithic structures and buildings can be found in southeast Anatolia, Syria, and Iraq by 8,000 BC with agriculture societies first appearing in southeast Europe by 7,000 BC, and central Europe by ca. 5,500 BC (of which the earliest cultural complexes include the Starčevo-Koros (Cris), Linearbandkeramic, and Vinča. The people of the Americas and the Pacific remained at the Neolithic level of technology until the time of European contact, including very small exceptions (a few copper hatchets and spear heads in the Great Lakes region). The Neolithic peoples in the Levant, Anatolia, Syria, northern Mesopotamia and central Asia were great builders, utilising mud-brick to construct houses and villages. At Çatalhöyük, houses were plastered and painted with elaborate scenes of humans and animals. In Europe, long houses built from wattle and daub were constructed. The megalithic structures of Ggantija, Tarxien, Hagar Qim, Mnajdra, Ta’ Hagrat, Skorba and smaller satellite buildings on Malta and Gozo, first appearing in their current form around 3600 BC, represent one of the earliest examples of a fully developed architectural statement in which aesthetics, location, design and engineering fused into free-standing monuments. Stonehenge, the other well-known building from the Neolithic would later, 2600 and 2400 BC for the sarsen stones, and perhaps 3000 BC for the blue stones, be transformed into the form that we know so well. At its height Neolithic architecture marked geographic space; their durable monumentality embodied a past, perhaps made up of memories and remembrance. In the Central Mediterranean, Malta also became home of a subterranean skeuomorphised form of architecture around 3600 BC. At the Hal Saflieni Hypogeum, the inhabitants of Malta carved out an underground burial complex in which surface architectural elements were used to embellish a series of chambers and entrances. It is at the Neolithic Hal Saflieni Hypogeum that the earliest known skeuomorphism first occurred in the world. This architectural device served to define the aesthetics of the underworld in terms that well known in the larger megaliths. On Malta and Gozo, surface and subterranean architecture defined two worlds, which later, in the Greek world, would manifest themselves in the myth of Hades and the world of the living. 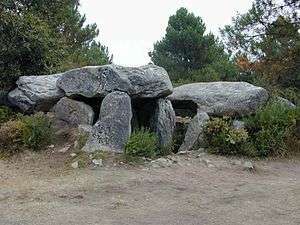 In Malta, therefore, we encounter Neolithic architecture which is demonstrably not purely functional, but which was conceptual in design and purpose. ↑ Gheorghiu, D. (2010). The technology of building in Chalcolithic southeastern Europe, pp. 95-100. In Gheorghiu, D. (ed. ), Neolithic and Chalcolithic Architecture in Eurasia: Building Techniques and Spatial Organisation. Proceedings of the XV UISPP World Congress (Lisbon, 4–9 September 2006) / Actes du XV Congrès Mondial (Lisbonne, 4-9 Septembre 2006), Vol 48, Session C35, BAR International Series 2097, Archaeopress, Oxford.